Back in print in a single volume edition! 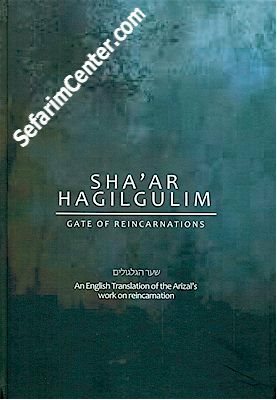 Shaar HaGilgulim (The Gate of Reincarnation) records the fundamentals of spiritual development and the journeys of the soul. Based on the writings of the master Kabbalist, Rabbi Yitzchak Luria - Arizal (1534-1572). The book was recorded by his foremost disciple, Rabbi Chaim Vital, and amended by Rabbi Shmuel Vital, his son. Shaar HaGilgulim explains how various Biblical personalities lived, died, and were reborn as different individuals. It links reincarnation to the concept of rectification (tikkun) on both the personal and world levels. The mystic's view of reward and punishment, the Garden of Eden, the Messiah, and many other Jewish concepts is presented. Written in a highly technical and esoteric style, this classic text of Jewish mysticism can be somewhat provocative. The English version was prepared by a group of scholars in Safed, Israel, from a translation by Rabbi Pinchas Winston. Please look inside this awesome book for more details.